ns. Hiking the trail is not for the faint of heart. Butler, 22, just graduated from the University of Rochester with a degree in economics before that she was a 2008 graduate of Windham High School. When else would she have a six month block of time to do something like this, she said. “I always wanted to. It seems like just a big accomplishment,” Butler said. As an outdoor lover, she had been hiking with her family, including climbing Katahdin, but she’d never backpacked. 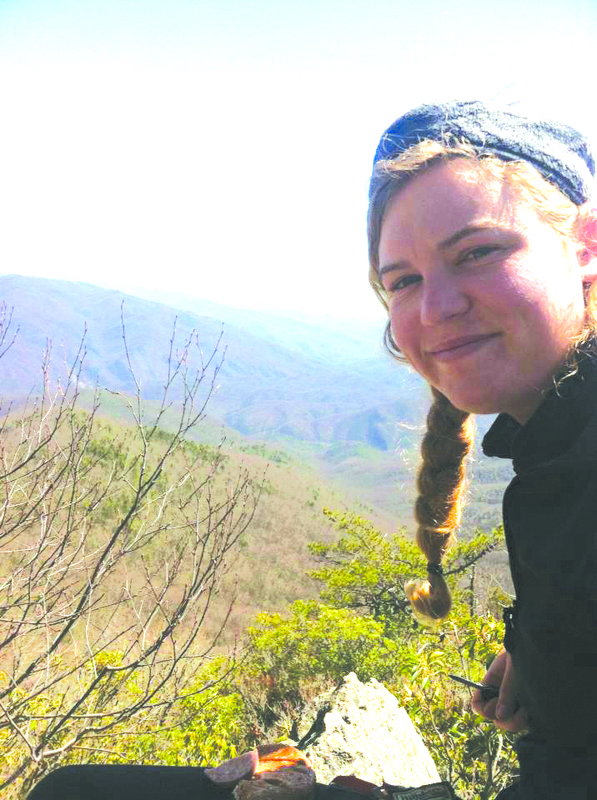 When she told her mother, Tracey, and her father, David, that she wanted to hike the AT, her father thought she should at least try backpacking first. “Maybe he was a little jealous,” she said. Her mom, wanted to protect her and keep her home. “Overall, they’re really supportive,” she said. At the start of the hike on March 16, there were many chances to jump off the trail during the eight miles leading to the top of Springer Mountain, the official start of the trail. She didn’t try to find anyone to hike with her before she started. “It’s hard to find someone with the same pace and you get along with,” she said. Her favorite part of the trip has been meeting people. She said she feels very safe although most of the hikers travel in pairs and she’s only met four solo women hikers, who happen to all be from Maine. She was given the nickname button because of a button tattoo she has on her ankle and a button she wears on her boot, a symbol of her college ultimate Frisbee team. “I tried to resist it at first, but people just assumed that was my name,” she said. “Everyone has a story. 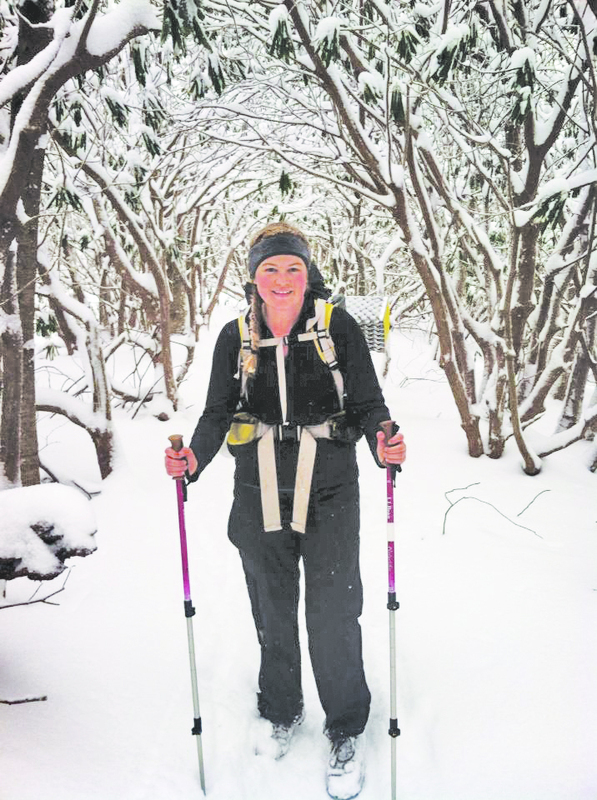 If you’re going to be on the trail, you’re a pretty cool person,” she said. 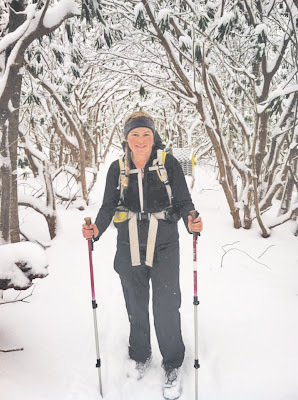 She has hiked 800 miles to date, often covering 20 miles a day. It wasn’t like that at first, she recalled, but once she got used to the hiking 20 was average. She carries her iPhone with her - most people on the trail have them. She uses it as her computer, camera and lifeline to civilization. Most towns have libraries where hikers can use the Internet and because her mother wants her to, she blogs occasionally. Her gear totals around 30 pounds. She carries her pack, one-man tent, sleeping bag, mattress pad, clothing (one change), rain gear, food bag (with three to five days worth), stove (made from an aluminum bottle), pot, water and purifying drops, toiletry bag, guidebook, reading book, journal and rope. “There are a lot of people out there. It’s like a big, long community,” she said. There were celebrations after every 100 miles and at every state border crossing. When they get into towns, the hikers hit pizza places and all-you-can-eat buffets. Butler craves bacon pizza, she said. Calories don’t count on the AT. At home it’s watch how many calories we consume, on the trail it’s more like comparing to see who has the more caloric honey bun, she said. “It’s a 180 from what society is used to,” she said. Her foods have been trial and error. Now she eats oatmeal with Carnation Instant Breakfast and a coffee packet mixed together with cold water. At lunch, she eats flat bagels, cheese and pepperoni. Dinner is a pasta side with a tuna or salmon packet. She did try Ramen noodles mixed with an instant potato pouch, but she never did that again. “I’m living minimalistically,” she said. Despite the fun she has been having, the challenges have been there as well. Noro-virus went around the trail making everyone sick. It snowed at the beginning of her trip and after 800 miles Butler got an infection from an abscess and spent time in a Virginia hospital. Her mother went to Virginia to pick her up. Butler is home for as long as her mother and doctor can keep off the trail. “I feel so lazy, stiff and restless. I want to go out there,” she said. She’s trying to decide when she goes back if it will be to Montabello, Virginia, where she got off the trail or to wherever her hiking friends are when she goes back. She’s torn. “If you’re into the outdoors, you’ll be into backpacking,” she said. 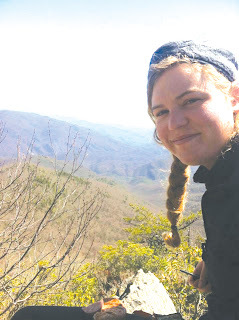 The Windham Eagle will be following Amanda Butler when she returns to the AT often printing excerpts from her blog and through phone and Facebook interviews. If you have questions for Amanda email editor@TheWindhamEagle.com.